ASHEVILLE — In an unprecedented demonstration of civic engagement, hundreds of thousands of young people and other activists will demonstrate Saturday in March For Our Lives events planned around the world. There will be 10 such events in North Carolina, including Asheville, where local students are organizing the march with assistance from the local chapter of Moms Demand Action. Asheville lead for Moms Demand Action, Jean Sutton, says it’s important to remember this call for change is something the Black Lives Matter movement began fighting for after Trayvon Martin was killed. March for Our Lives – initiated in part by the people behind the Women’s March – is calling for passage of legislation to address the gun-violence issues the country is facing. Since the Columbine shootings in 1999, more than 187,000 students have been exposed to gun violence at schools. 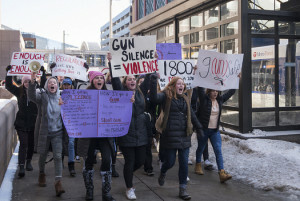 Kaaren Haldeman, a statewide volunteer for Moms Demand Action, says the engagement behind the March for Our Lives could be shaping the next generation of voters. Marches also are planned in Hendersonville, Burnsville, Raleigh, Durham, Fayetteville, Charlotte, Hickory and Wilmington. Sutton says the youth involved in the March for Our Lives are learning firsthand what going beyond the vote means. North Carolina currently has no restrictions on assault weapons, no caliber or magazine capacity restrictions and few restrictions on the open carrying of firearms. North Carolina’s U.S. Senators Richard Burr and Thom Tillis are among the top 10 recipients of National Rifle Association funding over the course of their careers – accepting a total of $11.6 million from the organization.